Skin aging is primarily due to two factors: a slowing down in skin cell metabolism, and damage to the support tissues by free radicals (oxidizing agents). 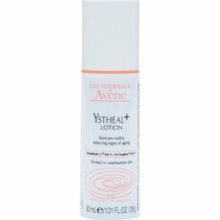 Ystheal+ Lotion works on two levels to help minimize the visible signs of skin aging, such as fine lines, with a powerful combination of retinaldehyde C.T. and pre-tocopheryl, clinically proven effective and exclusive to Avene Dermatological Laboratories. Recommended for normal to dry skin. Hypoallergenic and noncomedogenic.